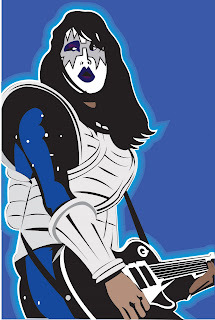 For your consideration, the Space-man himself; Ace Frehley! I've been super-busy today, so I'm afraid this one is a bit rushed. So much so that I don't think I'll be listing it in my shop unless I'm able to work with it some more. hey very cool! Great job! Any of Gene or Paul? What? no love for the cat-man? As Peter Griffin has said; "Even Peter Criss doesn't wanna be Peter Criss". No, I haven't done either one except for the Gene Simmons Mego portrait. It is however, on my list of things to do. I'm glad you like it - I almost didn't post it, but fear of losing my stuff encouraged me.